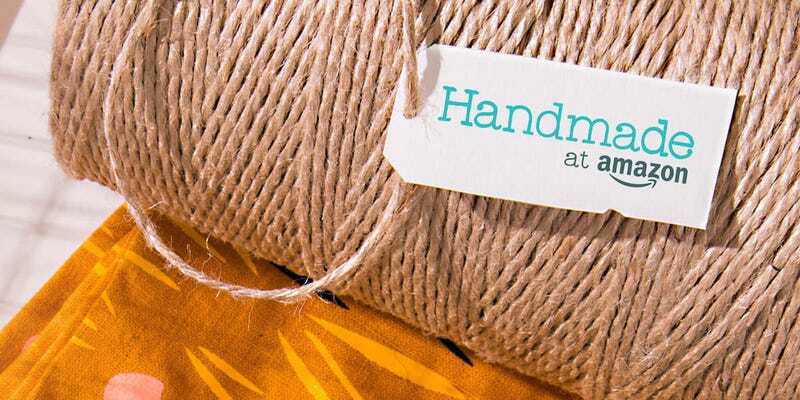 Amazon has just launched a new online store called Handmade. Much like Etsy, it will sell handcrafted items, serving as the middle-man between artisans and consumers. The store is divided into seven categories — Jewelry, Home Décor, Artwork, Stationery and Party Supplies, Kitchen and Dining, and Furniture — and there are already 80,000 items available to browse through. As you do so, you’ll find a profile of the company or individual who made the item, with links through to details about how they work. So, are you in the marker for some solid-walnut arrow-shaped cuffinks? Or a pink boombox art print? Maybe a pancake recipe kitchen towel? How about a set of cork coasters decorated with misremembered 90s lyrics? A teardrop stoneware mug with an austere white-blue glaze? As you can tell, Amazon it putting up a fair fight against Etsy. How the original handmade goods site, which recently went public with a $3.5 billion valuation, will fair against it, though, remains to be seen. Amazon certainly has a huge weight of commerce intelligence behind it, but as Engadget points out, some Etsy sellers have already been complaining that Bezos & Co. takes a bigger slice of the sales revenue. Either way, you now have another online destination from which to buy weird and wonderful handmade goods.